A recruiter takes 30 seconds only to scan through your resume. Does your resume have the needed punch to attract the recruiter? You like most people have written a resume which outlines your work history, skills and academic qualifications. But are you aware of the fact that your resume is your marketing brochure and the main objective of the resume is to make the potential employers take active interest in you. Your employer gets the first impression of you, when he reads your resume. Thus a well written resume would increase your chances to receive an interview call. Below we have discussed the fine points using which you can write a professional resume and praise yourself in it. When you write a resume, it should be based on simple facts related to your work history and achievements. If your resume is filled with subjective terms like “hard working team player”, recruiters and hiring managers would immediately send it to their Recycle Bin. It is best to create a Master Resume and then customize the resume according to the different job requirements. Finally your flawless resume would not give you a job. But it would help to make a hiring manager understand your selling points. This would enable them to call you for the first round of interview, for a potential job opening. 2. Do you need to take any preparations when you write a resume? The best way to write a resume where you praise yourself is by critically accessing your achievements. You can take a notebook and write down the achievements you have enjoyed over the years. These achievements could be related to professional work history, academic achievements and also regarding any volunteering or humanitarian activity that you have undertaken. After a few hours of brainstorming you can write the main points which need to highlight in your resume. While writing a resume you have to understand that it should be very crisp and attractive in nature. Otherwise the hiring manager would just dump it in the dustbin. 3. 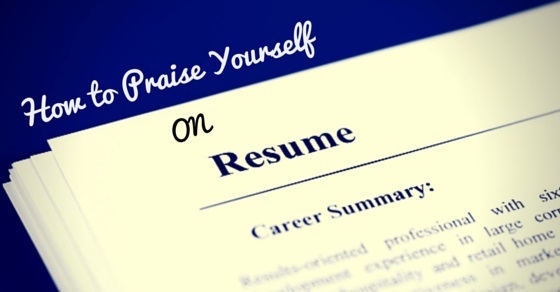 How do you praise yourself in a resume? When you are looking for a job, you customize and send your resume for different openings. When you are customizing the resume, you have to understand what is the skill needed for the job opportunity and then add the skill in your resume. For example if you are applying for the role of a project manager, you have to document the fact that you have years of experience as a client interface manager and that you are good at negotiations. When a potential employer views your CV, he would call you for the interview and discuss the experiences and skills you have in this area. When writing a resume, you have to subtly highlight your strong achievements. The achievement data has to be factual and the resume should never have heavy prose in it. Some effective words should be used in the resume like “Mature, honest and dynamic”. When the employer reads the above line, he would immediately understand that you are strong leader who can take quick decisions and also motivate the team to give their best. Most people do not add their professional references in their resumes. But one of the ways by which you can show to a hiring manager that you have undertaken critical high level projects, is by writing your professional references in a friendly manner. The references that you give would be verified and this would also highlight the type of work you have done and what is your reputation in the market. Thus do add references of people who have worked with you and not just people who speak well of you. Nowadays much software is used to select the right candidates. These softwares scan the resumes and look for specific keywords. Joyce Maroney one of the directors of The Workforce Institute at Kronos –Incorporated explains a simple fact that the resume should contain a few selective keywords which is mentioned in the job description. Once the keyword is added in the resume, you can be assured that your resume would be shortlisted for the next round. Here common keywords could be “pleasant attitude” and “willing to undertake responsibilities”. Wendi Weiner the founder of The Writing Guru is of the opinion that once the keywords are placed properly in your resume, your accomplishments would showcase the job functions for the openings and your highlighted skills would make you the best candidate for the job. One of the simplest ways to praise yourself in a resume is to highlight your various social media accounts. Hiring managers use social media network nowadays to search for the right candidate. When you share your social media accounts with them, you are giving them an opportunity to check how you are in your personal and work life. Richie Frieman an expert in this area however cautions the eager job applicants, that only when your social media account reflects your various professional posts, then only you can recommend them. This would show that you have a strong networking base and also you are following the trends of the day. But if your social media account is filled with personal life details, it is better not to share them in the resume. When highlighting your work achievements, use quantifiable facts. For example if you have been a sales manager, instead of mentioning that you have contributed to the growth of overall sales in your specified area, clearly mention the percentage of sales growth you had undertaken in the specified area. The moment you add numbers or facts, the resume would attract the attention of a prospective employer. Most of us write hating about our failures. But when you candidly accept it in your resume, this would indicate that you have learnt from your failures. The employer would understand the fact that you are open to learning, undertake self analogy and also react fast to situations. All these enviable qualities might make you crack a job opening which you had never expected. At the end of the discussion it can be added that when writing your resume do understand the main objective you have in mind and never forget it. Your main reason to praise yourself in a resume is to make the hiring manager and your potential employer aware of your skills and achievements. Thus never go over the top and never ever use flowery language in your resume.